“Rise and shine little one, it’s time to make pancakes” were the words my mom uttered every Sunday morning. 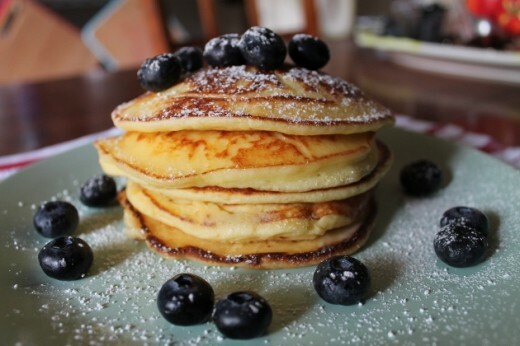 Pancakes are the ultimate breakfast comfort food and growing up my mom made buttermilk pancakes from scratch. So needless to say at 42, I consider myself quite the pancake snob, and even more so now that I’m living a gluten-free lifestyle. 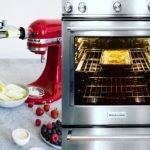 I certainly thought there was no way I was every going to be able to achieve that light, fluffy texture we’ve all come to love when taking a bite into a pancake hot off the griddle! But success has been achieved by playing in my kitchen and I’m sharing my love for the perfect breakfast food with you. 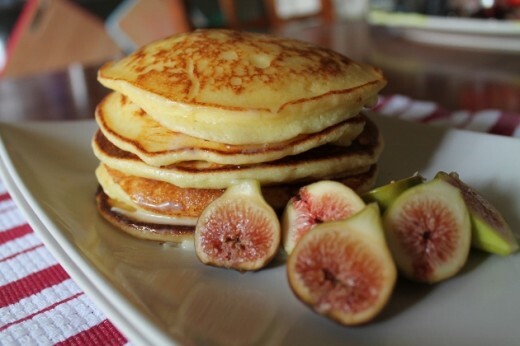 Ricotta Pancakes. Yes you heard me right. These are not just any pancake, they are a study in perfect airiness and my family has found themselves wanting more. The real magic lies in the whipping of the egg whites, which results in creating a creamy smooth texture throughout the pancake. Without my KitchenAid® Stand Mixer I would not be able to achieve the results needed to create such a pancake! 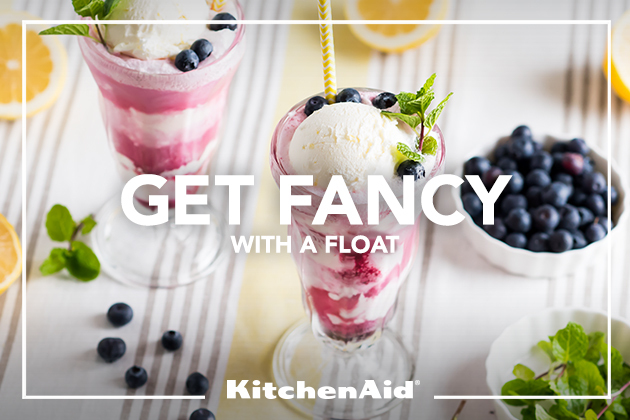 Keep a close eye while whipping these in your KitchenAid® Stand Mixer so you don’t over whip them. 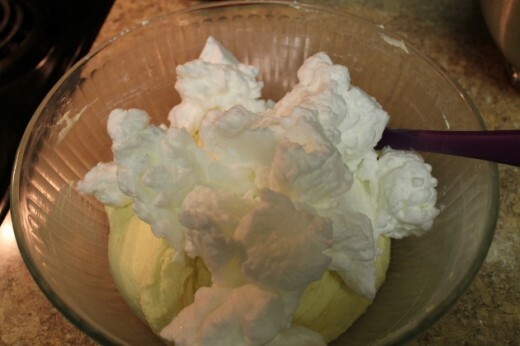 As you can see the egg whites have been whipped to perfection and have that shiny finish to them. 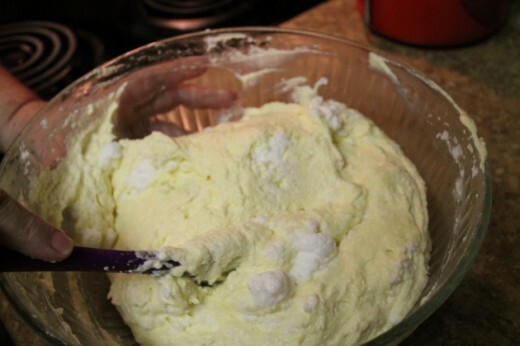 After you’ve sifted in the gluten-free flour, add in the egg whites into the batter. 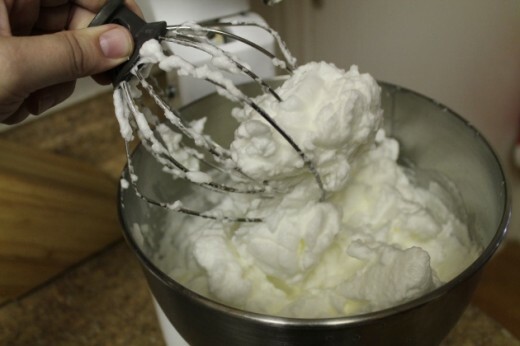 Slowly incorporate the egg whites into the mixture taking care not to over mix. Place a butter into a non-stick pan on medium heat. Next using a 1/2 cup measuring cup pour batter into pan. 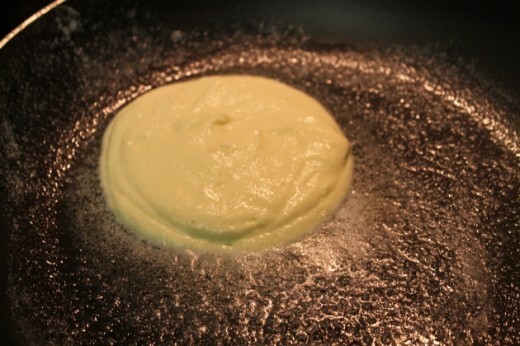 Batter will begin to bubble and set-up like traditional pancakes. 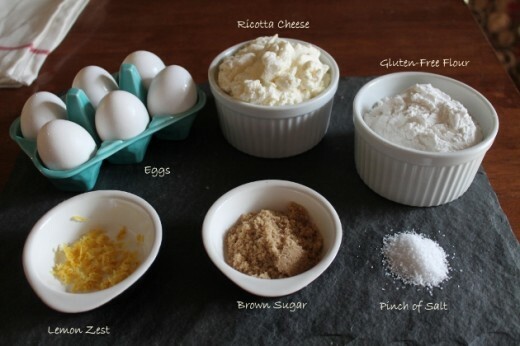 Measure out all of your ingredients and separate eggs, as this will make the preparation more seamless. 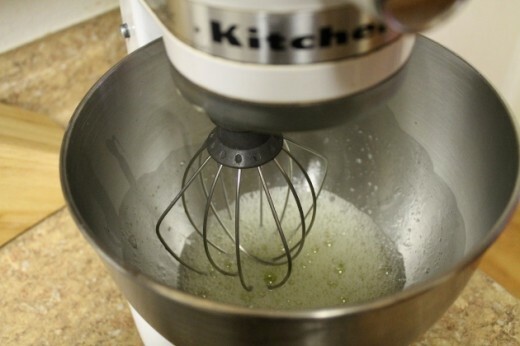 In your KitchenAid® Stand Mixer using the whisk attachment, add ricotta cheese, baking soda, salt, orange zest and egg yolks, thoroughly combining on slow to medium speed. 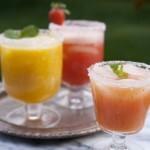 Remove mixture and place into a large mixing bowl and set aside. Sift in gluten-free flour separately into batter. 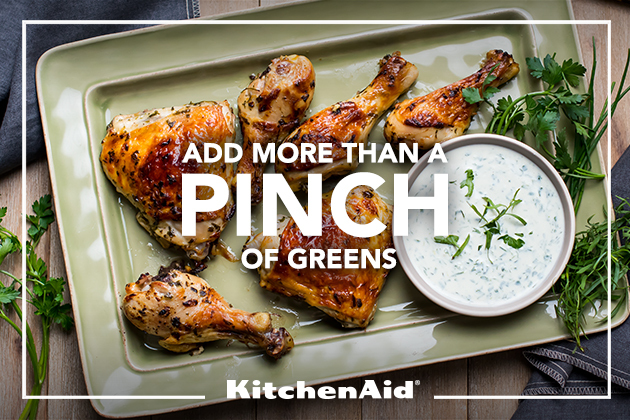 Wash out the KitchenAid® Stand Mixer mixing bowl and whisk attachment, making sure to completely dry in the inside of the bowl. Make sure the mixing bowl is cool after washing. You can throw into the freezer for a few minutes to cool off. Next place the egg whites into the mixing bowl, beating the egg whites until they begin to form peaks. You want the egg whites to be firm but supple. This is a critical part of the recipe, as the whipped egg whites add the lightness to the pancakes. Once the egg whites have reached their peak perfection, slowly fold the egg whites into the ricotta mixture in the large mixing bowl by hand. It’s important to slowly incorporate the egg whites so the end result is a light and fluffy pancake. Heat a griddle, cast-iron or non-stick pan over medium-high heat. 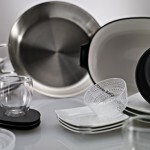 Cooking surface is ready when a drop of water sizzles away completely. Lower the heat to medium, and place enough butter to coat the griddle or bottom of pan. 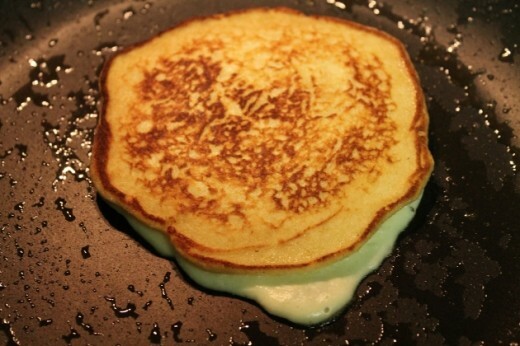 Slowly drop the batter onto the griddle or pan (1/2 cup measuring cup works well and creates perfect size pancake). Make sure not to overcrowd the griddle or pan. The pancakes will begin to set-up around the edges and puff up creating little bubbles on the surface. Flip the pancake over and cook another 1-2 minutes. Repeat until remaining batter is completely used. You can keep the pancakes warm in the oven at 150-200°F while you finish off the remaining batter or serve at once with your favorite topping. Tip: I prefer fresh fruit or preserves on my pancakes, but the perfect maple syrup will do just fine. So there you have it a delicious pancake recipe that will keep you coming back for more and pancakes so good you’d never know they were gluten-free!